As a custom home designer, I am constantly inspired by my surroundings. Whether it's a house I see while flipping through the pages of a magazine, while flipping through channels on TV, or even a house down the street, I find myself drawing inspiration from all architectural elements. Utilizing these elements in different ways helps to identify a number of different design styles. The fun part for me is identifying the distinctive design style that our homeowners would like in their custom home and applying the architectural elements to achieve that style. This past week I took a trip to Dallas to attend a wedding and visit some friends. One of the days, while my friends were working, I decided to hop in the car and go exploring. 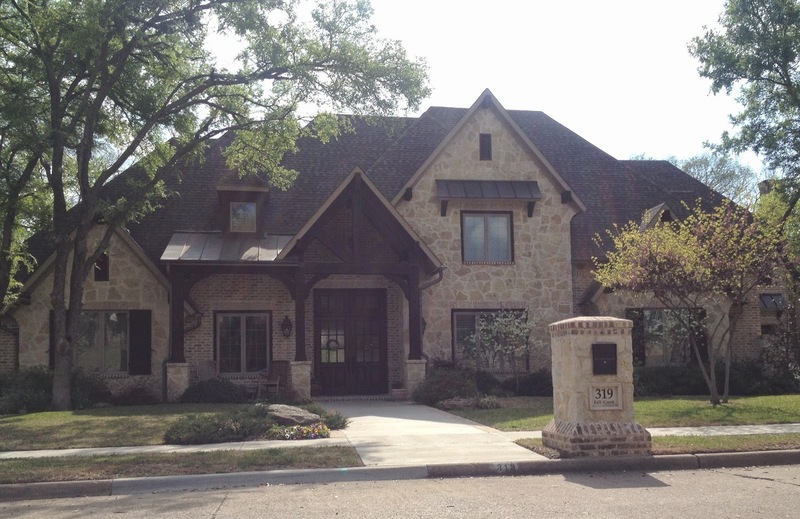 I drove around for a couple of hours checking out custom homes in the Dallas area. Ironically, what I found were several houses with a façade reflecting a style that is becoming more and more popular lately. There are even a couple of projects I am currently working on which will utilize some similar design aspects. I know I'm not supposed to think about work while I'm on vacation, 12 hours away, but I couldn't help it! So I snapped a few photos of some of my favorites, so I could always go back to look at them. I never know when or where I will draw inspiration!